Sagewood Studio - Quiet, Comfortable & Convenient! 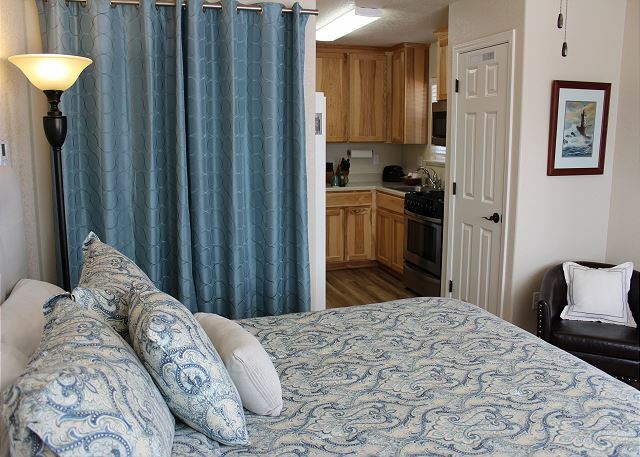 This is a studio with a queen bed, small kitchen, full bath & parking in the driveway. 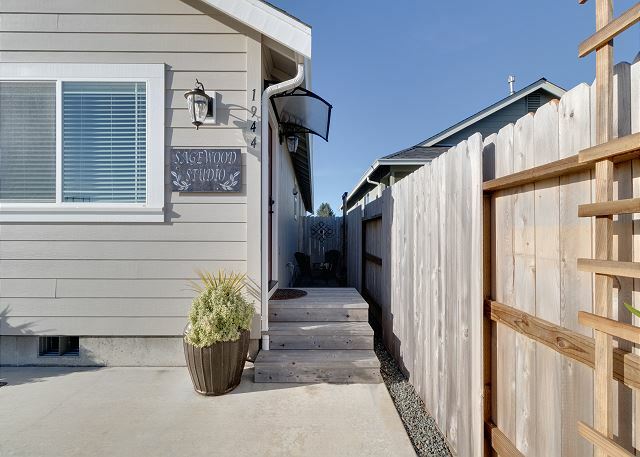 Located in a new development in McKinleyville, this studio is attached to a 3 bedroom home. We will consider only one dog, and it must be under 15 lbs, please. Central location with a short drive to Arcata or Trinidad, beaches, parks, shopping, movies, cafes, and plenty more. About a 40 minute drive to the Prairie Creek Redwood State and National Park with over 100 miles of trails through the Redwoods, including the famous Fern Canyon. This studio is also perfect for long term guests that wish to stay for more than a month. Clean comfortable room. Much better than a motel room. Fees for cleaning are high for a single room since 2 nights stay is required and cleaning fee is by the day. overall I liked the place for a no frills kind of place. close to everything I wanted to see. Thank you for your review of Sagewood Studios. We appreciate your feedback! However, I wanted to clear up an error I read in your review. The cleaning fee is a flat rate per property not per night, and we determine what that will cost depending on the size of the property. 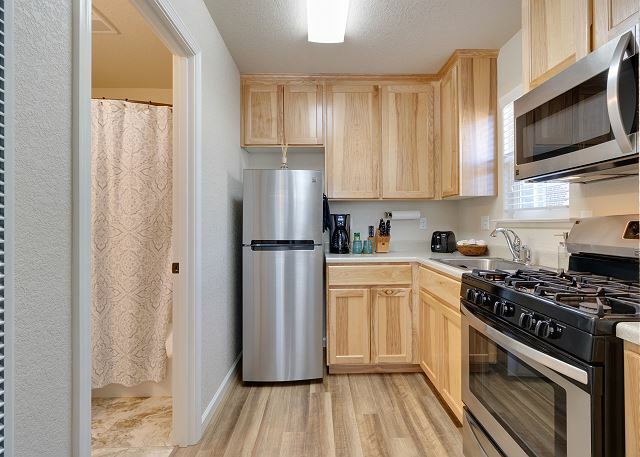 The rent, plus the cleaning fee is comparable to what you would pay for a hotel in the area, and Sagewood Studio has the added bonus of being private, pet friendly, and includes a full kitchen. We would love to have you back again to the property, please look us up at Redwood Coast Vacation Rentals hen planning your next trip to the North Coast! It was Ok. the first time I stayed in this location was better. They had added different furniture and stuff to fill the room. I thought the decor prior was perfect and didnt make it feel to over crowded. The main issue I had was that we came in late at night and the bedding smelled of smoke. They were nice enough to change it the next day but that was one night of sleep that was awful. They also mentioned it might have been from a prior tenant which made me wonder if they didnt change the sheets? Or what might have happened? Hi Brittany, I recall this situation as I am one of the people that helped with the issue. If I remember correctly, you had stated it was just the comforter and pillow shams, not the sheets, that smelled like smoke. My coworker takes the bedding to her house to wash, and she doesn't smoke, so we are not sure where it picked up the smoke smell. I offered to change all the linens, but you were fine with the towels and sheets remaining. Again, I'm very sorry about the situation and wish we could have taken care of it sooner. I will pass along your input on the rearrangement/addition of the furniture with the owner. Thank you so much for your feedback, and I am truly sorry about the experience! The tiny house was adorable and very clean with the perfect amenities. Directions sent me to the Large Green Care home behind the housing complex, but I am from the area originally, so was able to get to the location eventually. Pet friendly, great accommodations, perfect for 2, my 4 year old and I. I did feel weird about making noise, houses are very close together and a 4 year old is active. One small recommendation, the shower had a shower curtain, but didn't seem like the right type, wasn't sure it should go inside our outside the tub. Might recommend a liner that is plastic???? Thank you for the wonderful stay. Thanks for the feedback and glad you had a terrific stay! I haven't yet had a complaint about family noise so that isn't a concern. There are many families on that street. The shower liner goes inside the tub. It's a washable and we change that out regularly. No worries! We enjoyed our stay at the Sagewood Studio. The studio was very clean and the bed comfortable. There was everything we needed in the kitchen. We had some trouble with TV reception, but someone came within 5 minutes after we reported the trouble and fixed it. It was a very convenient location for accessing Redwood National Park and reasonably priced for the area. Enjoyed our stay! Wonderful that you had such a great time! Redwoods are especially nice and glad we were able to get your TV working so quickly. This Studio was perfect for us! Cozy, Clean & very Comfortable! Location was easy access to shopping. Central area for traveling to Arcata or to Trinidad. A Definate 5 star. Wonderful! We hope to host again on you next adventure to the Redwoods! Thank you for choosing Redwood Coast Vacation Rentals! We had a great stay! Everything looks new and clean! Thanks, Gina! Hope we can accommodate just as well for a future stay with Redwood Coast Vacation Rentals! We have 100+ vacation homes to choose from. Something for everyone! Beautiful place. Very hospitable and great location! Couldn’t ask for anything else! Hop[e we can host again! Redwood Coast Vacation Rentals appreciates your business! I stayed in this studio for almost three weeks and it was just perfect for me. Both the property owner and manager were very responsive to my questions. I would recommend staying here without hesitation! Thanks, Annette! Can't wait to have you back! My stay at Sagewood Suite was perfect for exploring Redwood National Forest. It was in a quiet neighborhood in McKinleyville so after a long day of exploring I was able to get a well rested nights sleep. Checking in and out was seamless with keyless entry and using the code that was sent. I was given a lot of information about check in/out, directions, etc per the app on my phone. The studio itself was clean and nice modern finishes as well. I definitely recommend staying there. Thanks for the great review and that you found your accommodations excellent! We hope we can host again with Redwood Coast Vacation Rentals! We were so fortunate to find this studio available for our stay to be at our sons graduation from HSU. It was new, so nice, clean, quiet and convenient. Thanks, Richard! And congratulations for the entire family on your son's HSU graduation. Your description of the Sagewood Studio is spot on and if you ever have need in Humboldt again, don't hesitate to contact us here at Redwood Coast Vacation Rentals! Better than a MOTEL Room! New and Clean with everything you need. Quiet Neighborhood. I prefer a vacation rental over a Motel Room which I almost booked until I remembered to check with Redwood Coast Vacation Rentals. I booked in late afternoon of my stay. So last minute works! Needed this home away from home for just 2 nights but would go back for sure! Thanks, Joanie! We will be here any time you are needing a last mintue booking during a business stay!